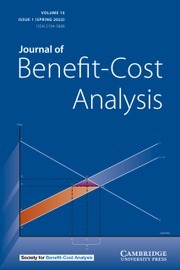 JBCA is the only journal devoted exclusively to benefit-cost analysis, the leading evidence-based analytical method for determining if the consequences of specific public actions make society better off overall. JBCA publishes theory, empirical analyses, case studies, and techniques. Applications include social programs related to education, crime, health, poverty, labor and housing as well as regulations and projects related to the environment, natural resources, transportation, safety, and security. The interdisciplinary nature, with contributors from a wide range of disciplines and areas of public policy, is unique. JBCA’s mission is to expand the use of serious, state-of-the art BCA by individuals and groups who make public policy decisions, those who advise, and those who implement the projects, programs, and policies. By serving as a bridge, the JBCA serves an important role that few other journals provide. Enjoy free access to this article of the month selected by JBCA editors.